Gall bladder disease can be treated through natural cures and home remedies. Prior to needing these remedies, however, it is important to understand what causes gall bladder disease and to avoid it as much as possible. However, if symptoms do occur, home and herbal remedies can offer relief and a reversal of the damage that has been done so that the gall bladder can return to its optimal functioning. Gall bladder disease is the result of the gall bladder, responsible for producing bile that helps in the digestion of fats, becoming inflamed, infected or forming stones that obstruct its normal operation. It is also known medically as acute cholecystitis. Although pain is one of the most often related symptoms of gall bladder disease, it should be noted that some patients do not feel pain and, for them, gall bladder disease is only detected in a physical examination. Generally, discomfort or pain is only felt when an obstruction occurs by a gallstone becoming stuck in the bile tract. Cucumbers and beets also have cleansing properties, but are known to cause gas in some. These can be taken in small portions if a person with gall bladder disease is able to tolerate them. By creating a cleansing flush of olive oil and lemon juice, many have been able to find relief from gall bladder disease and pass gall stones more easily. This concoction should be taken in small doses of only a few tablespoons at a time at 15-minute intervals to avoid vomiting and nausea, which may occur if it is consumed too quickly. While flushing the system in this manner, other foods should be avoided and plenty of bed rest should be obtained. 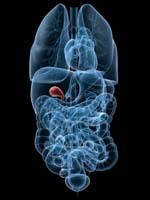 It is important for anyone who is suffering from gall bladder disease to also consider taking choline supplements while also using lecithin supplements to help in the absorption of choline. Choline is naturally present in the body and helps the gall bladder break down fats. Home remedies for gall bladder disease are non-toxic, promote a healthy diet, are completely safe to use and can help alleviate much of the pain and stress associated with an improperly functioning gall bladder. Even after a person has been cured, a healthy lifestyle and diet change should be adhered to in order to keep the gall bladder healthy and to minimize the risk of future issues.